This picture was probably taken in the 1950s. This shows the 300 block of WEest 4th Street from Monroe Street on the far right to Jefferson on the far left. North Side of the 300 Block of West Fourth Street from the 1923 Sanborn Fire Insurance map. Monroe Street is on the Right Jefferson Street is on the left. The Monroe Apartments were built in the early 1900s. The 1903 Sanborn fire insurance map shows an empty space there. The 1923 Sanborn fire insurance map shows the apartments are there. Sometime during a 20 year period these apartments were built.The street address for the Monroe Apartments on the 1923 Sanborn fire insurance map is 349 W. 4th St. Each Apartment was 5 rooms and bath. Basically the same picture only taken from Monroe Street. Showing the empty lot where Monroe Apartments once stood. There actually was another building beside Monroe Apartments that apparently was torn down at some point in time. Picture taken for Monroe Street looking at the west end of the 300 block of W. 4th St.
Picture taken from the west and the 300 block of W. 4th St. looking north were the Monroe Apartments once stood. This shows the empty lot where the house with a street address of 341 W. 4th St. once stood. The grey house there which is listed as a double house on the 1923 Sanborn fire insurance map is 339 W. 4th St.
A frontal view of 339 W. 4th St.. This pictures depicting going left to right 339, 335, 331 W. 4th St. Street addresses. I might add with the exception of the Monroe Apartments most or all of these houses are also on the 1903 Sanborn fire insurance map. Depicting the right side of 335 and a frontal view of 331 W. 4th St. You're also seeing an empty lot to the right of 331. Two houses, 329 and 325 that are depicted on the 1923 Sanborn fire insurance map have been torn down sometime after that. This in the next picture offers a better view of those two empty lots. In this picture on the left is a partial view of Persimmon Alley and on the right of it is 323 W. 4th St. which at least in the 50s was a house that had been divided into apartments upstairs and downstairs. Moving further eastward on the north side of the 300 block of W. 4th St. we see 323 and 321 W. 4th St.
We have to guess that this is probably 319 W. 4th St.. I say guess because the 1923 Sanborn fire insurance map does not show this house. It shows an empty lot. This house was built after 1923. This and the next picture shows 315 W. 4th St. The next three pictures show 311 W. 4th St. The brick house, 311 is to the left and the right side of 309 is on the right. Depicting 309 on the left and 307 on the right. The house on the left has a distinct modern look to it so how old it is is unknown. There is a house shown in that position on the 1929 Sanborn fire insurance map. Whether the two are one and the same is unknown. Left to right 309, 307 and 305 W. 4th St.. 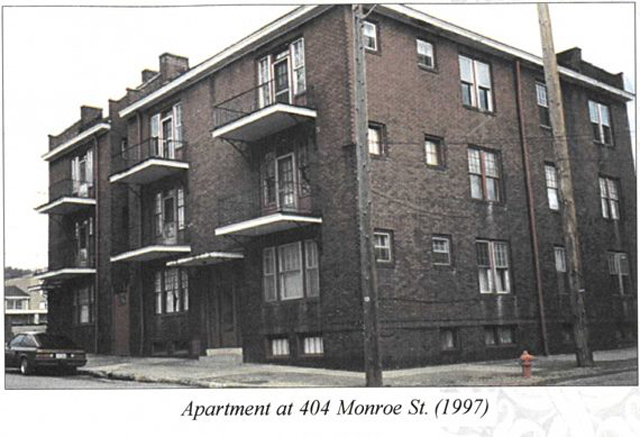 The house at 305 in the mid-50s was probably an apartment house and it was a hangout for a number of East Liverpool high school athletes most notably football players. It was not unusual to walk by and see a number of boys which if you followed East Liverpool high school sports especially football you would recognize sitting around on the front porch.